THE RACK can meet your heating demands whether heating a 10,000 square foot steel building or a 600,000 sq ft multi-tenant structure. THE RACK utilizes the industry’s most energy efficient heater and combines it with a ceiling hung air turn-over unit. The Energy Rotation (ER) unit has two distinct functions. First, the unit-heater controlled by the thermostat, cycles on and off based on the temperature demands of the building. And secondly, the ER’s rotation fan runs continuously distributing heated air evenly throughout the space. 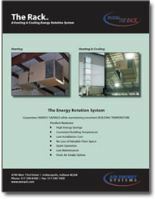 THE RACK, incorporated with conventional heating and cooling roof-top units, provides the most cost efficient method of maintaining temperatures in a facility. Utilizing any manufacture’s equipment, THE RACK mixes the unit’s discharged air with large volumes of returned plant air. The ceiling hung installation design allows THE RACK to turn over and distribute air with minimal electrical consumption…while preserving your valuable floor space. Example: 25 ton roof top units have a discharge air flow of 10,000 cfm. By discharging the 10,000 cfm into the ER-242, air circulation increases to 33,000 cfm… resulting in even temperatures through the facility. This process will eliminate hot and cold spots associated with standard heating or heating/cooling systems. The building maintains even temperatures and increases the comfort level for employees. We welcome the opportunity to partner with you on your next project and invite you to browse our website and contact us – or call (317) 290-8500 with any question you may have about your equipment needs.